A couple of days ago, I got a large and heavy envelope in the mail. I opened it today. Inside, I found a USB card reader, a 2 meter long USB cable, and a card. This... is Handelsbanken's new login solution. The stuff weighs in at 102 grams - that's the equivalent of a normal mobile phone! What were they thinking? Up until today, I've been using their online banking service pretty much everywhere. At home, on the bus, in the office... pretty much everywhere. So now they think I'll add the equivalent of a third mobile phone to my bag just to have the opportunity to use their service? Forget it. 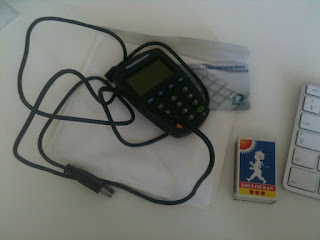 Since I've been working with online banking, I've had the opportunity and tried most solutions on the Swedish market. Since 1995. And this must be the worst solution ever. In 2010. But that 2 m long USB cable is my favorite. What were they thinking? If you know that you have the most clumsy security system for online banking in the history of mankind, ever, you might want to think about ways to at least take away a bit of that burden? Instead, Handelsbanken now gives you the opportunity to carry your card reader with you between rooms, wherever you want to go in your house. While the reader is still plugged into your computer, that is. PS. I've called Handelsbanken and asked if there are alternatives for using their Internet banking service. There aren't any. Of course there is an alternative - change bank!